According to top climate scientist James Hansen, extreme weather events such as the Moscow heat wave of 2010 and the Texas heat wave of 2011 would not have occurred in the absence of global warming. Hansen arrived at his conclusions alongside coauthors Makiko Sato and Reto A. Rued in a new document that compares extreme weather events of 1951-1980 with extreme weather events of today. Throughout their paper entitled “Climate Variability and Climate Change – The New Climate Dice”, Hansen and his colleagues use an analogy of dice to explain today’s climate variability. During 1951 – 1980, the world’s climate could be explained as colored dice with two sides red (for hot) two side blue (for cold), and two side white (for average conditions). But with human-induced global warming, the climate dice has changed, with four of its six sides now colored red. It is now more likely for the climate system to exhibit extreme hot events, as was experienced in the US this past summer. While these may be bold claims coming from one of the world’s leading climate scientists, they underscore some of the biggest issues with climate change – extreme weather events will have economic and social costs in the near-term. Not only is this the subject of the forthcoming IPCC report, but it is also the subject of risk analysis from insurance companies, who are becoming wary of the future variability of weather events under climate change. 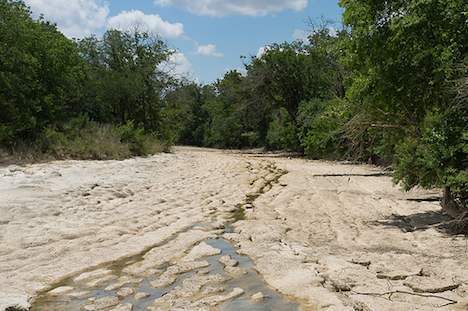 Image CC licensed by Earl McGehee: The Blanco River near the city of Blanco in Blanco County, Texas during the big drought of 2011.